Oil, which formed from ancient plants and animals deposited some 500 million years ago, is the world's primary fuel source for transportation and has been a defining force of our times. Oil created economies, but also condemned them; shaped political boundaries, but also bought them; won wars, but also created them; remade the urban environment, but also polluted it; released a low price tag, but "externalized" its true costs; created jobs, but abused rights and degraded health. Everything good that has come from oil has come at a price far higher than what you see plastered on billboards over gas stations - a price that nature and society shouldn't have to endure so heavily and an addiction that unless triumphed, will cause climate catastrophe and all of the subsequent ills that follow. 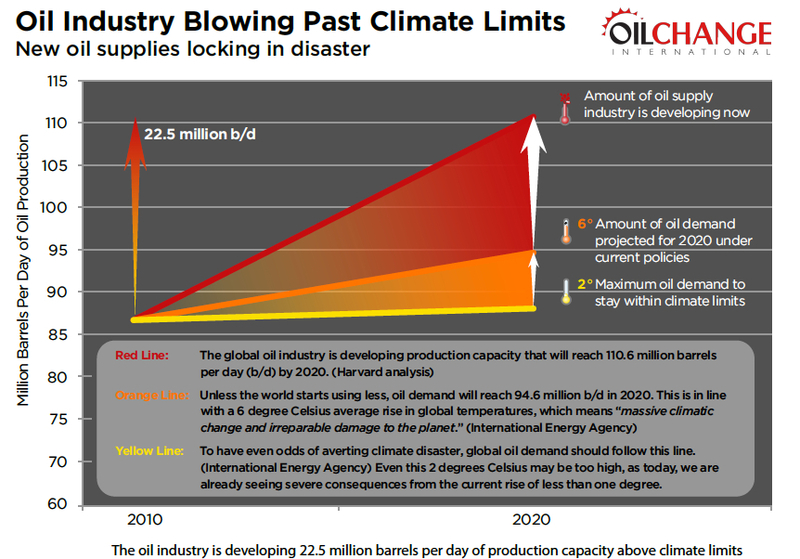 Oil continues to play a substantial role in society, but may become a uniquely 20th century phenomenon as the world quickly burns through our supplies of oil, which at current rates, are estimated to dwindle by the middle of the 21st century. With oil reserves becoming harder to reach and more expensive to extract, the fossil fuel industry has been turning to more unconventional sources of heavier crude oils, such as tar sands and oil shale, which is the equivalent of drug addicts running out of veins in their arms and legs and turning to their toes. Tar sands is the most destructive oil project on Earth, the most toxic fossil fuel on the planet and according to the world's leading, most respected climatologist James Hansen, tar sands oil is a global warming time bomb and "game over" for the climate. Oil shale is obtained through hydraulic fracturing, or "fracking", in an extremely water-intensive process where millions of gallons of mixed water, sand and chemicals, including ones known to cause cancer, are injected underground at very high pressures to fracture the rocks surrounding an oil or gas well and release the oil or gas from the rocks to flow into the well, which is causing a new global water crisis and according to Food and Water Watch, is "threatening the air we breathe, water we drink, communities we love and climate on which we all depend." Learn more. 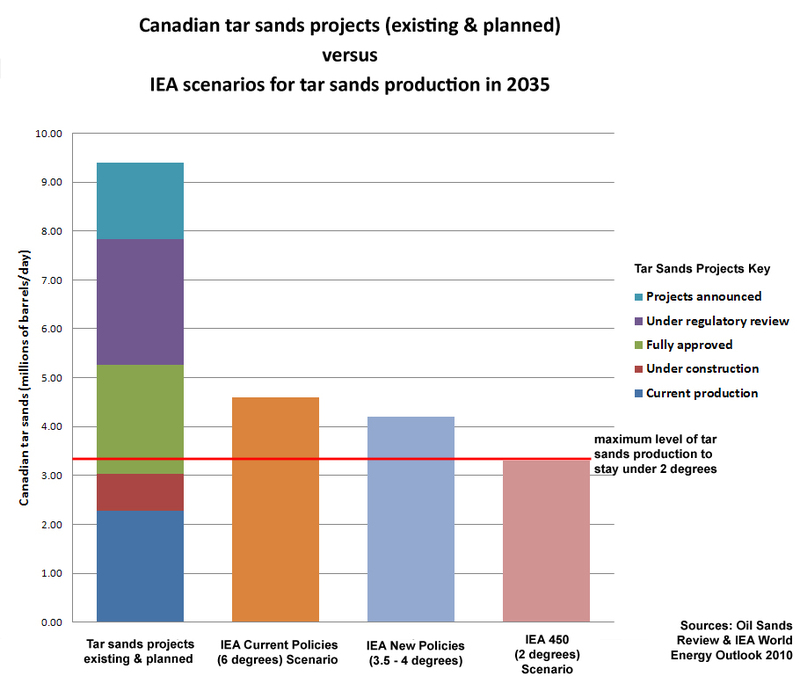 Source: Oil Sands Review & IEA World Energy Outlook 2010. Click to enlarge. Source: Oil Change International. Click to enlarge. According to "Drilling into Debt," an investigation on over over 200 countries into the relationship between debt and oil, their key findings were that: "Increasing oil production leads to increasing debt. Increasing oil exports leads to increasing debt. Increasing oil exports improves the ability of developing countries to service their debts, while at the same time increasing their total debt. 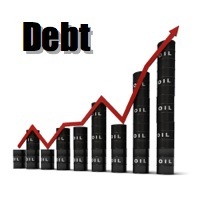 Increases in oil production predict increases in debt size. World Bank programs designed to increase Northern private investment in Southern oil production have instead drastically increased debt." Countries rich in minerals and hydrocarbons, such as oil, tend to suffer from high rates of poverty, malnutrition, child illiteracy, corruption, authoritarianism, civil war, indebtedness, poverty, inequality, poor public services and stunted economic growth in what has become known as the resource curse. According to Oil Change International, "It was often thought that whatever other curses oil brought, its vast revenues offered a path out of debt for oil exporting countries, and thus perhaps, eventually out of poverty. But countries that produce oil tend to be poorer, more violent, more corrupt, and less productive economically than they should be." Learn more. According to the Institute of International Studies, there has been a strong connection between human rights abuses and the companies and governments associated with fossil fuel operations. Oil and other fossil fuel production has resulted in a negative impact on gender equality by reducing the number of women in the labor force and consequently their political influence, forced relocation, appropriation of land, the brutal and sometimes deadly suppression of critics, and the creation of a 'repression effect', where resource-rich countries lose democratization by allowing the government to better fund tools of repression. Although the connections between human rights abuses and oil have been largely documented in developing countries, such as Ecuador, Nigeria and parts of the Middle East, there has been a growing documentation of communities raising human rights concerns in developed countries, such as Canada and the United States, which is stemming from more oil being produced in North America by extreme techniques, such as tar sands and oil shale. These extreme fossil fuel extraction technologies are adversely affecting indigenous communities in Canada by removing and contaminating water resources, restricting access to traditional hunting and fishing grounds and violating the treaty rights of the First Nations that are guaranteed by the Canadian constitution, and in the United States by creating water pollution, noise, odors, health problems and violating state constitutions. Learn more. Burning oil and oil spills lead to a plethora of consequences, ranging from global warming to local economic disruptions to air, water and land pollution, but also lead to harmful effects on our health. Burning oil and breathing oil smoke can cause serious damage to the lungs, irritate the respiratory tract, trigger an asthma attack, damage tissue lining both internally and externally, replace oxygen in the bloodstream with harmful gases, cause allergic reactions, immediate breathlessness, shortness of breath, extreme discomfort and cause unconsciousness and even death with extended exposure. According to the Union of Concerned Scientists, "Exposure to carbon monoxide can cause headaches and place additional stress on people with heart disease. Cars and trucks are the primary source of carbon monoxide emissions. Two oxides of nitrogen--nitrogen dioxide and nitric oxide--are formed in combustion. Nitrogen oxides appear as yellowish-brown clouds over many city skylines. They can irritate the lungs, cause bronchitis and pneumonia, and decrease resistance to respiratory infections. They also lead to the formation of smog. The transportation sector is responsible for close to half of the US emissions of nitrogen oxides; power plants produce most of the rest. 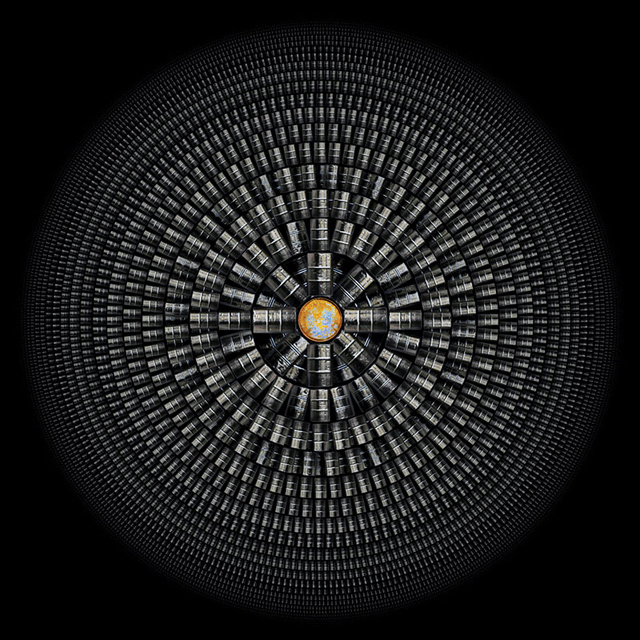 Human exposure to ozone can produce shortness of breath and, over time, permanent lung damage. Research shows that ozone may be harmful at levels even lower than the current federal air standard." Learn more. Credit: Oil Change International. Click to enlarge. As one of the most well established and profitable industries on the planet, the fossil fuel industry still gets to enjoy massive annual subsidies ranging from $10 billion to $52 billion in the U.S. and over $600 billion globally, with the five biggest oil companies raking in staggering profits of $62.2 billion in just the first half of 2012, which equates to $341 million each day. What to do with all of this extra money? Spend it on lobbying, of course! 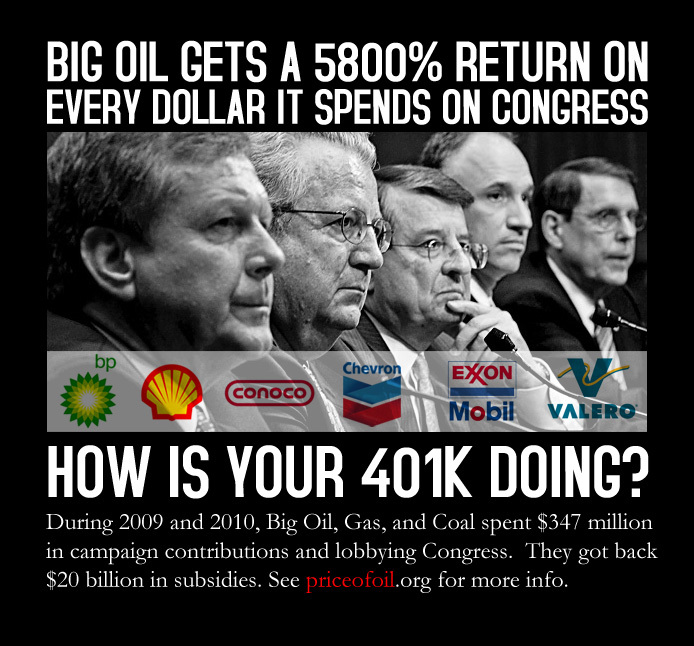 After all, big oil gets a 5800% return on the money it spends on Congress through campaign contributions and lobbying, which equates to $59 for every $1 spent! According to Oil Change International, "In the United States, regulations and legislation to promote transparency and fight corruption was opposed for years by the oil industry. 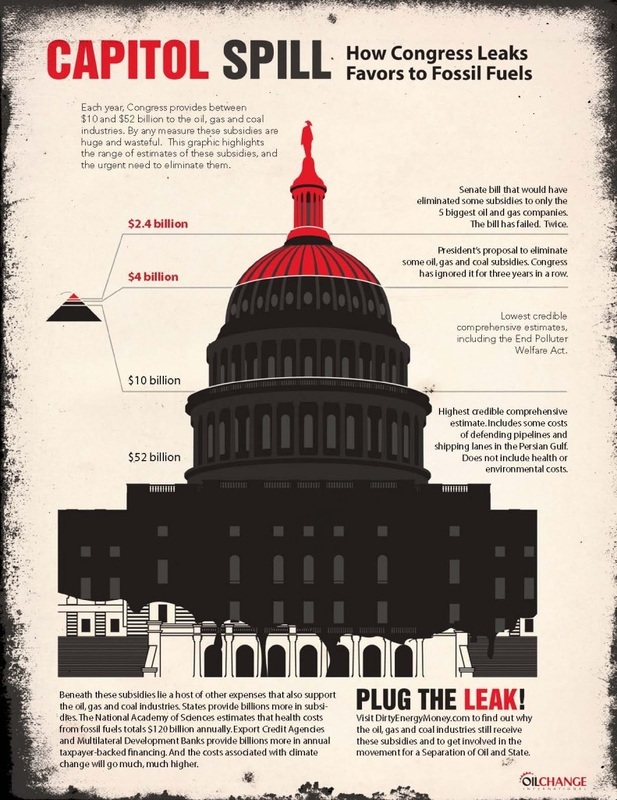 The worldwide trend of corruption surrounding oil and gas projects is well documented. The fossil fuel industry undoubtedly has a stranglehold on U.S. democracy, bribing elected officials with campaign contributions and pressuring them with millions of dollars of spending in strong-armed lobbying. In return, the industry is provided massive subsidies while raking in mind-boggling profits and giving their executives lavish compensation packages." In the United States where there is a broad acceptance to end our addiction to oil and begin to address global warming, it would seem conclusive to end such subsidies, which are helping to feed corruption and climate change. However, with an industry spending immeasurable amounts of money influencing elections and the legislative process and with the oil and gas industry alone spending nearly $150 million in lobbying Congress in 2011, there is undoubtedly and inevitably a distortion to the democratic process where the voices of those with the most money are heard louder than that of the American people. As OCI puts it, "When you have a bad argument, the only way to win is to corrupt the decision-making process. And that’s exactly what the fossil fuel industry does: in order to feed their greed for massive profits, the oil, gas, and coal corporations buy support for their polluting practices. And while Americans struggle to get by, the climate heats up due to emissions from fossil fuels, and Congress pours subsidies to their industry, fossil fuel industry CEOs swim in cash by way of exorbitant salaries and compensation packages. With so much money to gain and politicians in their pockets, the fossil fuel industry is corrupting our government and force-feeding a status quo energy policy that will lead us to climate catastrophe." Learn more.